I've featured this style of bead crochet tutorial before. This is an easy technique which requires single crochet with lots and lots of beads on fishing line. The result is light yet spectacular. You do not need to be a crochet whiz in order to make this! 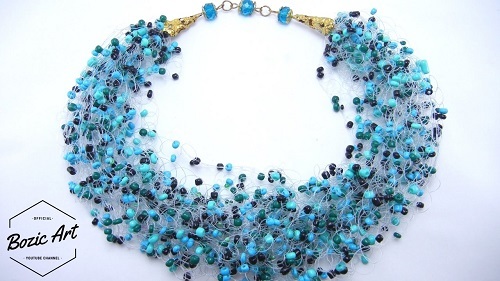 However, the tutorial by Smiljana Bozic of Bozic Art, shows a great finishing tip after crocheting the beads. This results in a long, long length of soft and somewhat floppy work. She manages to set the lengths of the crocheted line needed for the necklace by using pins on a foam board. Once set, you can see where to hook up the ends which will then be finished with conical end caps. I really like this style of jewelry. The colours shown are spectacular! My only thing is keeping everything untangled! Much like fishing...when the line gets all tangled the air turns blue for some odd reason. This is a GREAT method for making this type of necklace!! The best thing about this is that it does not involve keeping track of multiple strands, and then trying to wrangle them all together into the end cone. The simplicity of this is actually mind boggling. Thank you so much for this one! !